The Designer Series Clear Lens LED Submersible Trailer Lighting Kit By Blazer International features a state-of-the-art ultra bright red super diode lights for ultimate brightness. Comes with a durable rubber mounting grommet. 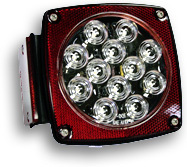 The kit comes complete and includes all legal lighting equipment for trailers less than 80" wide. Ideal for utility, snowmobile, camping, motorcycle and boat trailers. You can set the lights be used as a stop light, taillight or turning light. Ultra long bulb life with over 100,000 hours of light means no bulbs to change or replace. 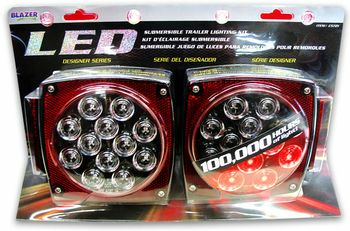 Get the Designer Series Clear Lens LED Submersible Trailer Lighting for a crisper, cleaner and brighter light for improve visibility and safety. Designed to meet and conform to applicable U.S. FMVSS 108 and Canadian CMVSS safety standards. 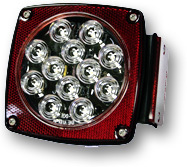 For Snowmobile, Camping, Motorcycle and Trailers Under 80"